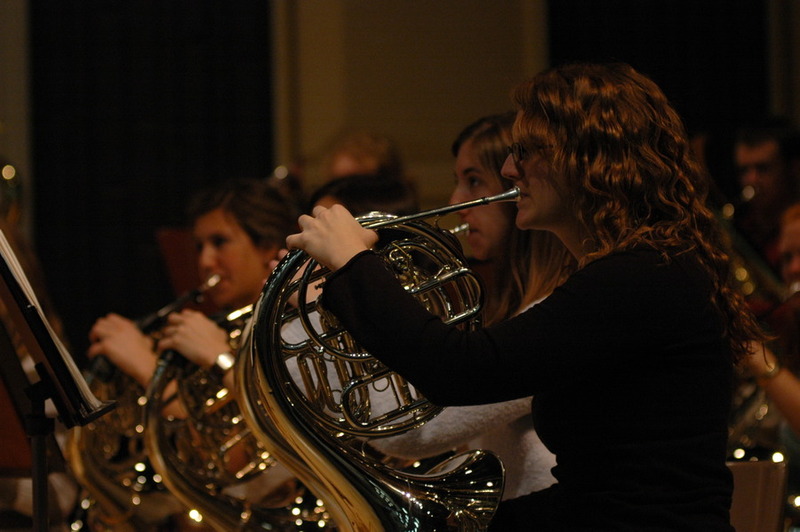 Senior Kate Ellingsen leads the Gustavus Wind Orchestra’s horn section. Home concerts by the Gustavus Choir, Wind and String Orchestras kick off the spring music season this weekend on the campus of Gustavus Adolphus College in St. Peter. With the Gustavus Choir’s return from Spain and Portugal and the wind and string orchestras’ recent mid-western tours, the three ensembles open the spring semester with their annual Home Concerts on Saturday and Sunday, February 10 and 11. The Gustavus Wind Orchestra and Conductor Douglas Nimmo open the weekend of music with a performance in Christ Chapel at 3:00 p.m., Saturday, February 10. It’s program includes works by Aaron Copland, Vaclav Nelhybel, Morton Gould and the American premiere of Yukio Kikuchi’s Suite for Wind Music. Senior clarinetist Becky Palermo is featured as soloist on Carl Maria von Weber’s Concerto for Clarinet, Op. 26. Fresh off its return from Spain and Portugal, the Gustavus Choir and Conductor Gregory Aune appear in concert on Saturday evening at 7:30 p.m. in Christ Chapel. The Choir’s recent concert tour included performances in Lisbon, Seville, Malaga, Granada and Madrid. Its program includes a wide variety of choral works by Morten Lauridsen, Tomas Vittoria, Robert Shaw, Aaron Copland, Randall Thompson and others. Two works commissioned for the Choir, Stephen Paulus’ I Will Be With You (commissioned by friends of Courtney Lynn Walker at J. F. Kennedy Center for the Arts) and David Cherwien’s Hope in God (the Heilman Sacred Choral Works Endowment for the Gustavus Choir), will be featured in the Choir’s third set. Sunday’s concert by the Gustavus String Orchestra and Conductor Warren Friesen begins at 3:30 p.m. in Jussi Bjorling Recital Hall. This ensemble features the strings of the Gustavus Symphony Orchestra and has recently returned from a concert tour of Minnesota, Nebraska, Kansas and South Dakota. The program includes Paul Hindemith’s Trauermusik, Morton Gould’s Five Spirituals, Tchaikovsky’s Serenade for Strings, Op. 48 and Vaughan Williams’ Five Variants of “Dives and Lazarus” among others. Soloists Rachel Dorr, Mark Wamma, Kelly Simmons are featured in J. S. Bach’s Concerto for Three Violins in D Major, followed by ‘cellists Christa Saeger and Jacqueline Johnson in Antonio Vivaldi’s Concerto for Two ‘Cellos in G minor.